“The atmosphere of Eureka was something that, when I was young, I couldn’t have imagined existed." In the tiny town of Eureka Springs, Ark., residents live in the shadow of a 67-foot statue of Jesus. Yet Portland filmmakers Donal Mosher and Michael Palmieri discovered that Eureka Springs isn't quite the conservative Southern hamlet outsiders might imagine. "Obviously, we have our own political positions and political beliefs, being who we are—gay men who live now," says Palmieri. "It's easy to assume that Christians in the South are going to be like the typical evangelical preacher." But Palmieri and Mosher discovered that the reality of Eureka Springs was far more complex. "Everyone was Christian. The LGBT members of the community were also Christian," Palmieri explains. "It was a group of Christians trying to negotiate all these different positions on their faith and on how they should live in the world and in the same community." Eureka Springs is vividly chronicled in Mosher and Palmieri's documentary The Gospel of Eureka, which will screen on the final night of this year's QDoc Film Festival. The film delivers a powerful meditation on the role that performance plays in both Christian and LGBTQ communities, and in this ruthlessly polarized era, its portrait of a vibrant queer culture nestled deep in the Bible belt can't help but fill you with hope. 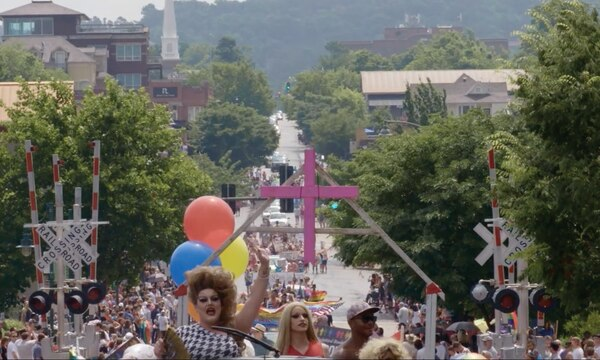 Mosher and Palmieri's fascination with Eureka Springs took root during the making of Peace in the Valley, a 15-minute short about Arkansas' bathroom bills, which attempted to prevent transgender people from using the public restrooms that correspond to the gender with which they identify. In Eureka, the directors were entranced by the unlikely but unmistakable similarities between The Great Passion Play, a local production chronicling the last days of Christ, and the local drag bar, Eureka Live Underground. "Everyone expressed their identity, whether it was their Christianity or their sexuality, through performance," says Mosher. "So there were two stages where people were performing in ways that complicated the stereotypes about both identities." The directors decided to structure The Gospel of Eureka around alternating scenes from Eureka Live Underground and The Great Passion Play. They stayed up late to film raucous, faith-themed musical performances at the drag bar and even donned robes and joined the cast of the play so that they could film it from onstage. Mosher and Palmieri interviewed Eureka Springs residents like Kent Butler, the charismatic and obsessive actor who plays Jesus in The Great Passion Play, and Walter Burrell and Lee Keating, the gay Christian couple who own Eureka Live Underground. Burrell and Keating's argument about whether the devil exists is one of the film's most thought-provoking ruminations on the nature of faith. Though Keating had cancer during the filming of The Gospel of Eureka, he is a vibrant and mesmerizing presence onscreen. "Their spirit is amazing," Mosher says of Burrell and Keating. "For all the Christianity in the film, there was a devil's spirit in Lee—'I have cancer, I'm going to keep smoking and drinking.'" Undeterred by his illness, Palmieri says Keating was determined to participate in the film. "They were going to be damned if we didn't continue collaborating with them in the way that we started," he says. Despite its sometimes utopian message, The Gospel of Eureka includes some upsetting scenes, such as protesters shouting slogans like "Jesus can deliver you from homosexuality!" and "I hate the wickedness of the world!" For Mosher, filming moments like that were particularly personal. Raised in North Carolina, he fled the South when he was 17 after enduring "constant gay bashing and some pretty brutal circumstances." Yet making The Gospel of Eureka seems to have roused Mosher's optimism. "The atmosphere of Eureka was something that, when I was young, I couldn't have imagined existed," he says. "The film was made to celebrate this queer community in the South. People don't imagine that these communities can even exist, let alone thrive. We wanted to show you this happening and let the world see that this is a possibility." SEE IT: The Gospel of Eureka screens at the Hollywood Theatre, 4122 NE Sandy Blvd., 503-493-1128, qdocfilmfest.org, on Sunday, May 20. 7 pm. $10, free for 23 and under.